Need Help Choosing The Correct Product? Click Here To Start The Wizard. Need it Quick with Zero Installation Cost? A device designed to ensure that noise levels remain within a preset limit. Usually music from live bands or DJs but also industrial processes. The purpose of a noise or sound limiter is to prevent noise nuisance to members of the public or to safeguard against possible damage to employees hearing. Also known as Sound Limiter, Noise Limiting Device or Noise Control System. Buy this if you allow DJs or bands to bring their own sound equipment into your venue. • Monitors sound levels using a built in or external microphone. • Clearly indicates the music volume level in real time. • Power is reconnected after 10 seconds . . . [Find Out More] This style of sound limiter can be used in almost any situation but is usually the only viable solution when bands or mobile DJs bring their own equipment to your premises. If you own or manage a pub, bar, village hall or other establishment where live music is played you can safeguard your licence and avoid the possibility of large fines by ensuring that musicians plug their equipment into a power socket controlled by a noise limiting device of this type. Sanction noise limiters will usually need to be fitted by a professional electrician as mains voltage connections are involved. 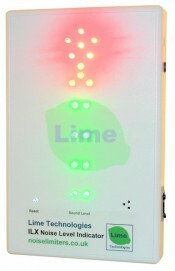 The Lime NLX (v2.2) is set to become the new industry standard product in this category. Also available in a portable version for use in marquees or other temporary locations - click for details. • Keeps noise levels within your selected limit . . . [Find Out More] This type of noise control system is usually only suitable if the sound system or at least the power amplifier is permanently installed in the venue. A device which is connected between the mixer or sound source, a karaoke machine or CD player for example, and the main power amplifier. The unit continually monitors the sound level (preferably using a separate microphone) and reduces the volume if a preset limit is exceeded. The Lime Technologies VCX featured below is the latest noise limiting device of this type, matching the quality of the industry standard Formula Sound AVC2D but at a lower price. Occasionally this type of product is referred to as a compressor / limiter, however compressor / limiters ruin sound quality and usually are unable to limit noise levels to a particular decibel setting. Consequently Lime Technologies recommend that compressor limiters should be avoided. For venues where a noise limiter is not required but high noise levels must be avoided or clearly indicated, a noise warning device can be installed. Cheaper than a noise limiter and with virtually zero installation cost, the Lime Technologies ILX Noise Level Indicator monitors sound levels using a built in microphone and displays the level relative to your preselected maximum. Also useful for industrial premises to indicate when hearing protection should be worn. Legislation provides that as from 1 October 2006, local authorities have been able to issue fixed penalty notices in the region of £500 to the person in charge of the premises at the time of any noise complaint. This could be the license holder, manager or any other employee. This is in addition to their existing powers to serve noise abatement notices and review premises licenses. As from April 2008 entertainment venues must comply with The Control of Noise at Work Regulations to ensure that workers hearing is protected. Most local authorities and environmental health officers require the installation of an electronic noise limiting device in village halls, pubs, bars, clubs, restaurants, health clubs and other entertainment venues to minimise complaints regarding noise pollution. Many schools and colleges also fit a noise limiter in music department practice rooms in order to protect students from possible hearing damage. Eagle G920A Sound Level Controller now discontinued - Please see Lime NLX (v2.2) for replacement product. Drawmer SPL2120 discontinued - Please see VCX for replacement product. AIMS minim Mk IV Entertainment Noise Controller now obsolete - Please see Lime NLX (v2.2) for replacement product. Audioblock Sound Level Enforcer now obselete - Please see Lime NLX (v2.2) for replacement product.